Shaikh ʿAbd al-Qādir al-Gaylānī was born in Gaylān, west of Iran, in 1077 CE to two well known saints of their time. He is a descendant of Prophet Muḥammad [PBUP] from both his parents. Both of Shaikh ʿAbd al-Qādir’s parents were saintly persons who led a perfect Sufi life, totally detached from this world and completely obedient to Allah. This is how these saintly parents are described in the words of their saintly son: “My father renounced this world despite his ability to earn a lot in it, and my mother agreed with him on that and was pleased with his actions. They were among the people of righteousness, religion and compassion for Allah’s creatures”. Shaikh ʿAbd al-Qādir started to show karāmas soon after birth. When he was an infant child he would not suckle his mother during the daytime in the fasting month of Ramadan. When the overcast sky prevented the people from watching the crescent for the first day of Ramadan, they asked his mother who told them that her son refused to take milk on that morning. It turned out later that that was indeed the first day of Ramadan. After the departure of his father from this world, Shaikh ʿAbd al-Qādir al-Gaylānī stayed with his mother until the age of eighteen when, after having a vision, he asked for her permission to move to Baghdad, the capital of Sufism and knowledge. 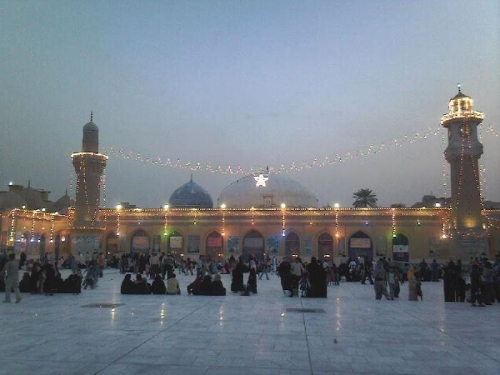 In Baghdad, he accompanied Shaikh Ḥammād ad-Dabbās, a well known Sufi saint of the time, who predicted that Shaikh ʿAbd al-Qādir would attain such a high spiritual station to declare: “My foot is on the neck of every saint”. For almost twenty five years, Shaikh ʿAbd al-Qādir traveled the deserts and wilderness of Iraq, for several years he did not eat more than what was essential to keep him alive and for about forty years he would never sleep at night in order to worship Allah, performing the ṣalāt of dawn with the ablution of the evening ṣalāt. One of the major miraculous wonders that sheds light on the exceptional spiritual status of Shaikh ʿAbd al-Qādir and the role that Allah had assigned to him in promoting Islam took place on a Friday in 1117 CE. While on his way to Baghdad, Shaikh ʿAbd al-Qādir came across a frail and sick man who saluted him saying: “As salāmu ʿalayk”. As Shaikh ʿAbd al-Qādir returned the greeting, the man asked him for help to sit up. When Shaikh ʿAbd al-Qādir gave the requested help, the sick man started to grow big in stature. The person then asked Shaikh ʿAbd al-Qādir if he knew him, but Shaikh ʿAbd al-Qādir answered in the negative. So the man explained to Shaikh ʿAbd al-Qādir: “I am the religion of your grandfather. I have become sick and miserable but Allah has revived me with your help”. After this encounter, Shaikh ʿAbd al-Qādir continued to go on his way to the mosque to perform the Friday prayer. At the mosque, a man approached him and gave him a pair of shoes and addressed him with the title of “Muḥyī ad-Dīn” which means “the reviver of religion”. This became one of the titles of Shaikh ʿAbd al-Qādir. Through his miracles, teachings and followers, Shaikh ʿAbd al-Qādir did indeed spread Islam everywhere in the world. His influence and guiding efforts were so great that most of the Sufi schools that are existent today trace their origin to him. Shaikh ʿAbd al-Qādir then accompanied the great Sufi Master of the time Shaikh Abū Saʿīd al-Makhzūmī and succeeded him as the Master of Ṭarīqa. In 1127 CE Shaikh Abū Saʿīd al-Makhzūmī put Shaikh ʿAbd al-Qādir in charge of his well known school in Baghdad. However, Shaikh ʿAbd al-Qādir did not sit to preach. One day before the ṣalāt of midday in that same year, Shaikh ʿAbd al-Qādir saw in a visionary dream his grandfather Prophet Muḥammad (PBUH) who asked him why he was not preaching to the people. The saintly grandson replied that he could not speak in the presence of the orators of Baghdad as his mother tongue was not Arabic. The Prophet (PBUH) then spat seven times into his grandson’s mouth and asked him to start preaching to the people by means of words and righteous deeds. After the ṣalāt, Shaikh ʿAbd al-Qādir sat down and people gathered around him, but he felt nervous. At this point, he saw before him his other great grandfather Imām ʿAlī bin Abī Ṭālib who spat six times into the mouth of his grandson. Shaikh ʿAbd al-Qādir asked him why he spat into his mouth six times rather than seven. Imām ʿAlī replied that he did that out of respect to the Prophet (PBUH). This is one of the miraculous events which underlines Shaikh ʿAbd al-Qādir’s following reply to the question about the source of his divine knowledge: “In the past, it was my Master Ḥammād ad-Dabbās, but now I drink from two seas: the sea of Prophethood and the sea of chivalry”. The term Arabic term of “chivalry” is “futuwwa” which is derived from “fatā” which literally means “noble knight” and which is one of the titles of Imām ʿAlī bin Abī Ṭālib. The large number of books that Shaikh ʿAbd al-Qādir wrote on both Sharīʿa, “the Law”, and Ṭarīqa attest to the depth of his divine knowledge. This miraculous event provided Shaikh ʿAbd al-Qādir with a great deal of spiritual knowledge and with the ability to preach to the people with eloquence and perfect command of the language. Thus, the school of Shaikh ʿAbd al-Qādir, where he used to teach three days a week, became the ultimate destination of the seekers of truth and divine knowledge. He lectured at his school for about forty years since it was made over to him in 1127 CE until his departure from this world in 1166 CE. He also taught and acted as a jurisprudence for thirty three years from 1133 CE. Shaikh ʿAbd al-Qādir attained spiritual stations and states that no other Sufi Master after him reached. He was raised to such a status in the world of sainthood that in 1165 CE Allah ordered him to make his unique, well-known declaration: “My foot is on the neck of every saint,” as had already been predicted about him by Shaikh Ḥammād ad-Dabbās and some other saints. All saints of the time heard his words and all of them bent their heads in compliance with this divine order. One saint in Asfahan refused to comply so he lost his spiritual blessings. This is how he came to be known by the title of “Sulṭān al-Awliyā’ [the Sultan of Saints)”. Shaikh Muḥammad al-Kasnazan stresses that this unique declaration means that the foot of Shaikh ʿAbd al-Qādir is on the neck of every saint who would appear until the Day of Resurrection and that there would be no saint greater than Shaikh ʿAbd al-Qādir after him until that Day. Shaikh ʿAbd al-Qādir al-Gaylānī left this world for the spiritual world on the night of Friday 11th/February/1166 CE, after naming his son Shaikh ʿAbd ar-Razzāq al-Gaylānī to succeed him as the Shaikh of Ṭarīqa. The great Shaikh was laid to rest in his school in Baghdad which millions of people from all over the world visit seeking blessings from this most sacred Shaikh.